Many of you may know that since the loss of our son Billy in June of 2004, that we have and continue to receive many different type’s of signs from our son Billy in heaven, of which many of them have been written about in past entries on our blog. Because of the holiday’s coming upon us I have decide to show you a collection of spirit photographs which have been taken over the past 6 years at Christmas time. Our collection of spirit sign’s from our son Billy during the holiday’s are in the form of streaking lights and heart-shape images of our Christmas tree lights. Our video is put together with some of our favorite spirit light sign’s with Christmas music. We hope that you truly enjoy our holiday video. Our video link is below. Remember, our loved ones who have crossed over to heaven, can and do send us signs that they are still very much with us. I receive emails about the different types of signs from our son Billy and from others about receiving signs from their loved ones. Although I have been sharing our photography signs from our son Billy, because it is a type of sign from our son Billy, that I am able to share with everyone because they can be seen. Instead of telling a story with words, a photograph can be a story in it’s self. Your welcome to visit our website www.oursonbilly.com and read our complete story and view a few pages of some of the type of signs that we continue to receive from our son Billy. I would like to share a few of some of the other type of signs which we and others who have connected with us about their signs from their loved ones. 1. Dreams – Our loved ones can and do connect with us through our dreams. I have had dreams about our son Billy which have helped me move forward and with the work of our website. We also had someone who has suffered the loss of a child some years earlier, tell us about a dream that he received, about that we got together to talk about our losses, which happened. He told us about the dream after we gotten together. 2. Lights – Lights flickering on and off. We have motion sensor lights which our son Billy will blink on and off to get our attention. 3. Smell – Sometimes while thinking about our loved one, we may receive a very familiar smell which is connected with our loved one. 4. Pennies – You may keep coming across a coin. You can always check the coins date, it may have something of importance from your loved one, like the date of their birth, passing or anniversary. 7. Seeing our loved ones – On occasion, our loved ones can and do appear to us. A number of our family have had a visit from our son Billy, myself included. 8. A song – While thinking about your loved one, their favorite song or a song that reminds you of them starts to play. 10. Electronics – For us Billy has connected with us from time to time through electronics. Billy would make the cursor or arrow on the computer screen move across the screen in all directions. On our Xbox video game, Billy would at times take control of the opposing football team, which was fun to watch. The door bell ringing once and no one is around, the phone ringing only once. With my cameras, while taking photographs, the pictures would come out sideways or upside down. 11. Repetitive signs – Any of the above any in many other type of signs. It may be the way that they are trying to connect with you. Photo’s are our favorite way of receiving sign from Billy at this time, of which the Heart-Shaped images of the moon street lights, Christmas tree and other lights are our favorite. We also received Heart-Shaped images in clouds and on a job site while looking down between my feet I found a heart-shaped stone which I keep on my desk. For us hearts are a way of connecting with our son Billy. Of course, this is only a small sample of some of the ways that our loved ones who have crossed over to heaven are connecting with us. There are many other ways that our loved ones can and do connect with us, I believe they try to find a way to connect with us in a way that we feel comfortable with and can understand. Since the loss of our son Billy on June 26 2004, I have and continue to receive many signs from Billy, many are through photographs, which brings me to this photograph that was taken a few days ago, November 30 2010. 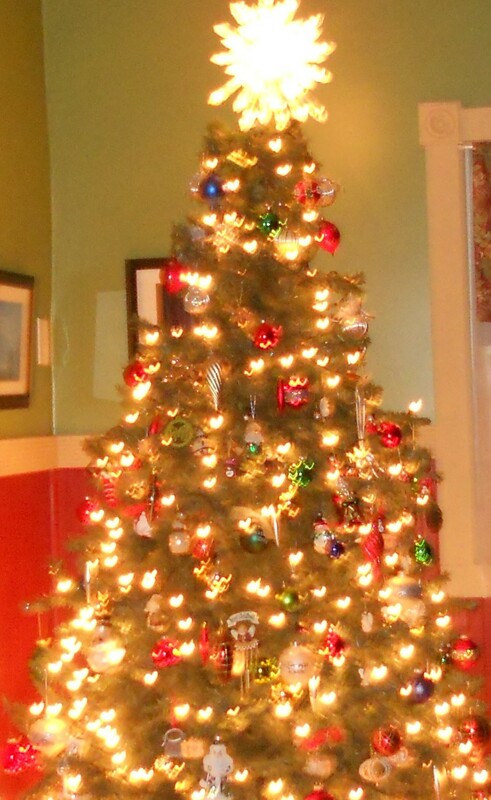 My wife Jo-Anne loves to set up the Christmas tree right after Thanksgiving along with all the trimmings. Ever since I realize that Billy was giving us many signs through photographs, I began to keep a record of all the photographs that we have taken, including at Christmas time. My first year that I started taking spirit photographs which was in the spring of 2005. When Christmas time came that year I took a few photographs of the christmas tree, and sure enough, there was some type of spirit activity, whether it was orbs, streaking lights and my favorite heart-shaped images of all the lights, something would almost always show up. We have a website www.oursonbilly.com which everyone is welcome to visit and view a few pages of types of spirit photographs that we have and continue to receive, including some past photos of our christmas tree. Again this photo below was taken a few days ago, November 30 2010 with my new camera a Nikon coolpix S3000. This is a close-up view of our Christmas tree, if you take a close look at all of the lights on our christmas tree you’ll notice nearly every light has taken the form of a heart-shaped image. They are and will always be my favorite sign from Billy, obviously because of what the heart-shaped image represents….Love. I have a friend Mary Shannon Bell, whose blog you may also want to visit. 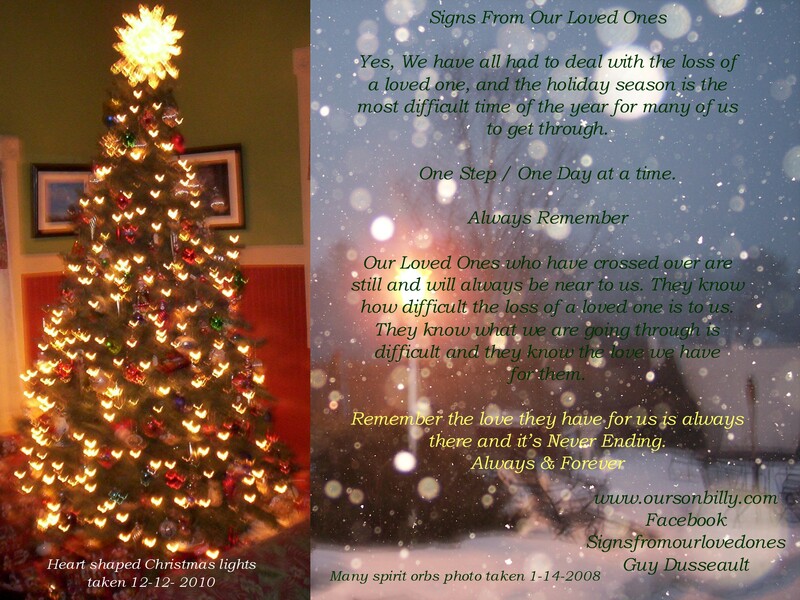 Mary’s latest blog on November 30 2010 is about Holiday signs that our loved ones from heaven leave us. Mary has a list of the different types of signs that our loved ones can and do leave us. You can visit mary’s blog at www.maryshannonbell.com/blog .